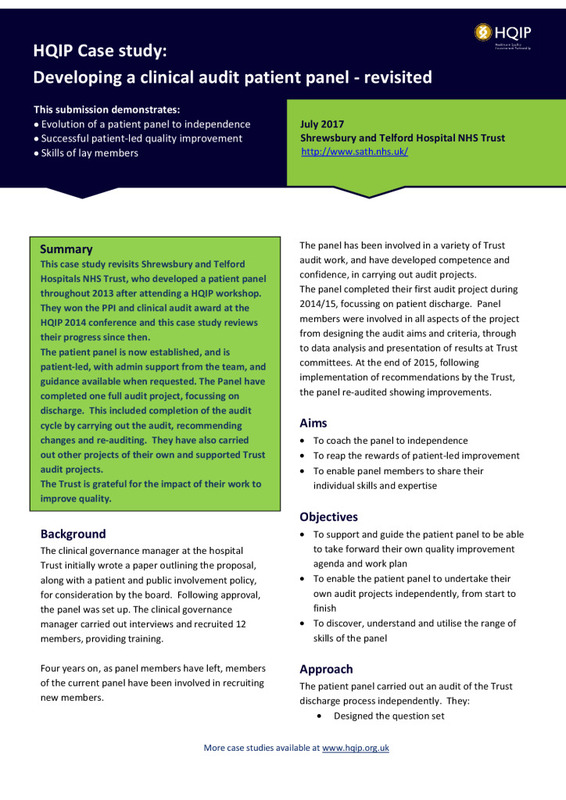 A 2015 case study which has recently been updated from Shrewsbury and Telford Hospitals NHS Trust, who developed a patient panel throughout 2013 after attending a HQIP workshop. They won the PPI and clinical audit award at the HQIP 2014 conference and this case study reviews their progress since then. The patient panel is now established, and practically patient-led, with support available to them where requested. They are now completing their first independent audit project from end-to-end. The Trust has been impressed by the panel’s professionalism and are grateful for the impact of their work to improve quality. This submission demonstrates evolution of a patient panel to independence, successful patient-led quality improvement, and skills of lay members.